This white paper provides an overview of successful recruiting in the era of digital transformation. It offers an in-depth look at the characteristics of the modern workplace, insights into what matters most to today’s employees, as well as practical tips on how to build an appealing company culture. What motivates millennials in the workplace? 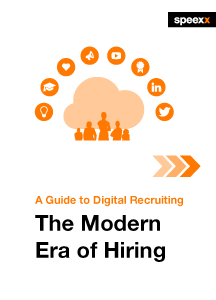 What are the best HR & digital recruiting practices? How can digital recruiting help you build a strong employer brand? Hiring vs. Educating —What’s the Better Value? In 2015, organizations saw a 62% increase in their hiring volume, but only a 42% increase in their budget for recruitment. This gap between the number of people that organizations would like to hire and the budget they have for recruitment is only getting wider. In this video, Speexx Founder and President Armin Hopp discusses what HR professionals should consider when developing workforce skills in-house versus hiring external talent.